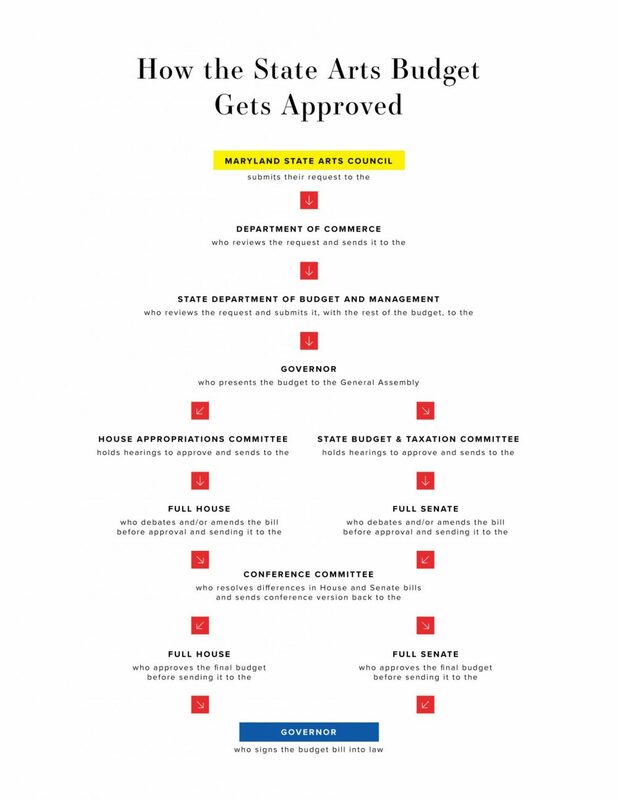 This is why MCA works to educate the Governor and Executive Branch about the arts and cultivate strong relationships with agencies under the executive branch, especially with the Department of Commerce and the Maryland State Arts Council (an agency within Commerce). To be enrolled, a bill must be passed in both houses of the General Assembly. To begin this process, any one bill must be read on three different days in each house. There are a lot of issues to be discussed and voted on each year, so the House and Senate divide into committees, to get most of their work done. Every bill, including the state budget, is assigned to the appropriate committee for review. The fate of most legislative proposals is determined in committee. The first committees to review the state arts budget are the Senate Budget & Taxation Committee/ Sub-Committee on Education, Business and Administration and the House Committee on Appropriations/ Sub-Committee on Education & Economic Development. After committee consideration, a bill is open to amendment from the floor; this is the second reading of a bill. Any adopted amendments are added and the bill is printed for the third reading, when the legislature will vote to pass or reject the bill. Advocates trying to keep tabs on any one bill are at the mercy of a rather hectic process, where second readings and voting schedules are subject to last minute changes. With a large advocacy committee of individuals regularly in Annapolis, MCA can report back to the field on any developments where action is needed. This can be a critical time to call or write. A bill passed by one chamber (“house”) is then sent to the opposite chamber and the process is repeated (steps 4-5). Any amendments made by the second chamber have to be agreed on by the first. If the House and Senate chambers can’t agree, a conference committee may be appointed to resolve the differences. A committee made up of 3 members from each house will send the resulting report back to each chamber. If rejected, the bill fails. If adopted, a vote will be called for final passage of the bill in each house. When the Legislature is finished, the budget goes to the Governor to sign. Information on this website to find contact information for all the current Senators and Delegates that serve on the budget committees can be found here. These committees make the recommendations to the full House and Senate on the Governor’s budget bill. Their recommendations are typically followed, so these legislators are ones to focus on contacting about the Arts.